Anyone who works with their hands a lot knows the importance of a good tool box, whether you are a DIY tinkerer or a handyman. Every person’s tools and space requirements are different. The toolbox must conform to that. Weekend warriors and professional mechanics have different expectations when looking for the best toolbox. However, we have handpicked a range of tool boxes that provide for every level of handyman and professional. As looking for a tool when you need it can drive the best of us crazy. This toolbox is the perfect all-rounder choice. Not only is the material durable, but the capacity is also good and the toolbox is built to resist damage. This is an American made product and who wouldn’t want to purchase American muscle at such a good price? This Stanley creation stands apart due to its sturdy structural foam construct. In a reasonable price range, the toolbox is well built and does a good job protecting power tools. The material’s texture is like a scratchy, brittle plastic. It might not look like much at first glance, but that’s what gives the toolbox its strength. Stanley 028001L tool box is well built and does a good job protecting power tools. This tool box has a half tray that makes it easier to store bulkier tools and has room for smaller ones in it. The hinges are sturdy and don’t flog all the way back when you open the toolbox. Waterproofing seal protects tools from damage in case of accidents. The box is well-built and holds well under the weight of heavier tools as well. Once bent out of shape, the tool box can remain that way. The space inside could be more. All in all, this is a great tool box for the price. If you need a lightweight toolbox that protects your electronic tools from water damage this is a great investment. 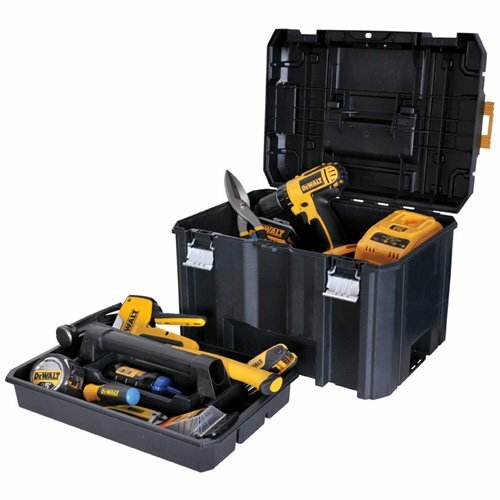 If you are not in the market for an expensive toolbox, this model covers all your basics nicely. Not only is the handle comfortable space is just enough to cover all your immediate storage needs at a cheap price. 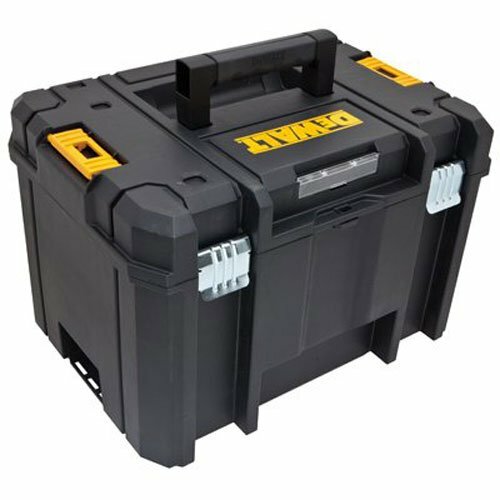 Dewalt has many great toolboxes, this one stands out because of its deep storage capacity and the long handle that makes it sturdy and user-friendly. If your tools are big this is a great choice. 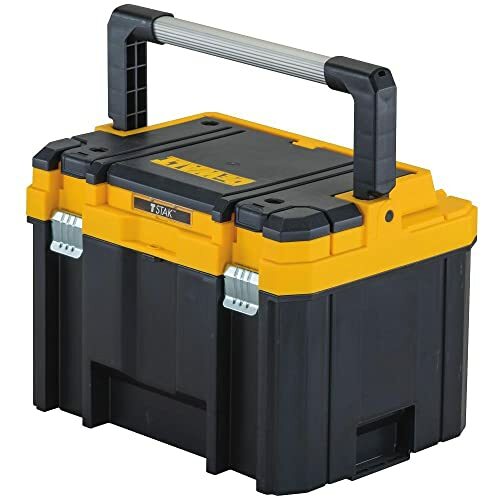 This toolbox is designed for very heavy loads but is perfect for essential tools like screwdrivers, drills etc. The handle is a great feature as it distributes the weight and makes for easy lifting. One of the best things about the TSTAK series of toolboxes is that they are all compatible and stackable. The bottom bends up under medium to heavier loads, the placement and structure of the feet need improvement. If you are a handyman with a few tools that are always scattered around or a tradesman on the move, this toolbox is a good choice. 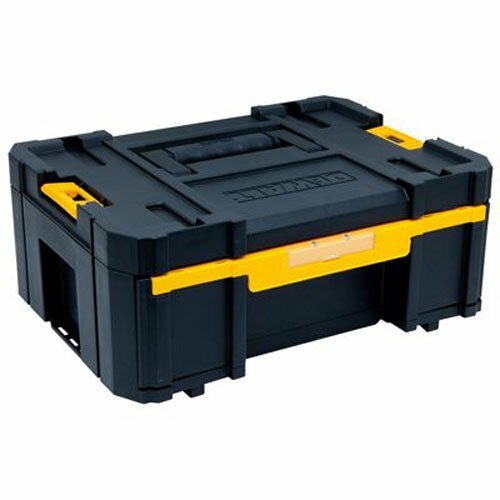 This toolbox is designed for very heavy loads but is perfect for essential tools like screwdrivers, drills etc. The look of this toolbox is one of the best things about it. The length is perfect for regular use and the construct of the box allows storage for heavier tools. If you are looking for something that looks stylish and retro while serving a purpose this is good. The look of this toolbox is one of the best things about it. The length is perfect for regular use and the construct of the box allows storage for heavier tools. Perfect for carrying tools in your car or for specialized trade tools like electrical or plumbing ones. This toolbox comes with a padlock eye. A sufficiently wide handle so that it doesn’t cut into the holder’s hand. Good dimensions for longer tools at a very affordable price. The tray inside is plastic and not steel. The tray runs along the length of the toolbox and is very shallow making it more or less useless from a storage point of view. 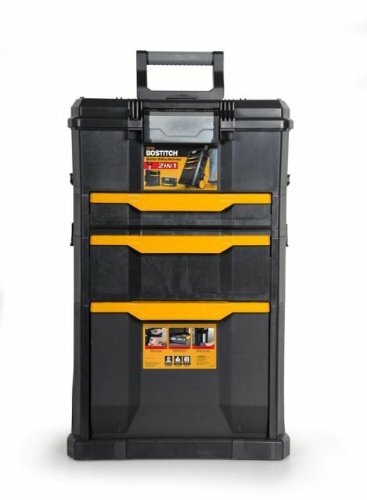 This stack on the model might not the be the best toolbox, but it is a good one and an excellent choice for people looking for a longer storage option for their tools. When it comes to automotive hand tools, this is a good option. This toolbox is the perfect all-rounder storage unit for all your tools. The storage capacity is very good at 3465 cubic inches. 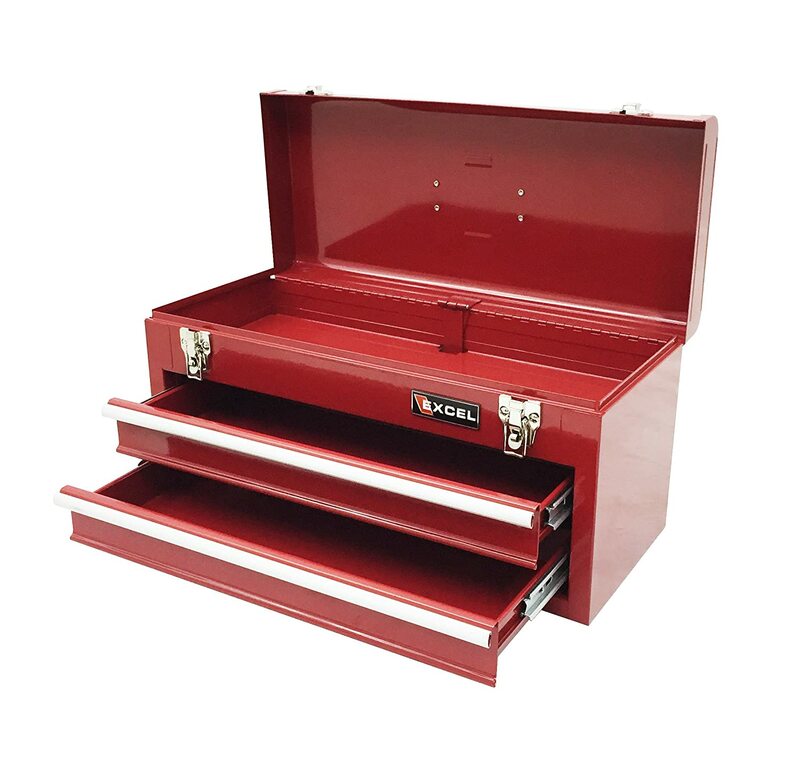 This toolbox is the perfect all-rounder storage unit for all your tools. The storage capacity is very good at 3465 cubic inches. Thanks to the wheels, this toolbox is mobile with great space and organizers. Husky 25 in. Heavy Duty is mobile with great space and organizers thanks to wheels. This storage unit has 18 compartments that can be easily customized for specified storage. The top folds out and offers sectional inserts. Can be locked with a padlock. The construct is plastic but very sturdy. The cantilever lid is a design marvel, offers safety and unique storage option. There are no dividers and small items can get mixed up in the compartments during transport. Return policy states that the consumer has to pay a 20% restocking fee! So be sure to read the fine print and whether you want to buy this storage unit. 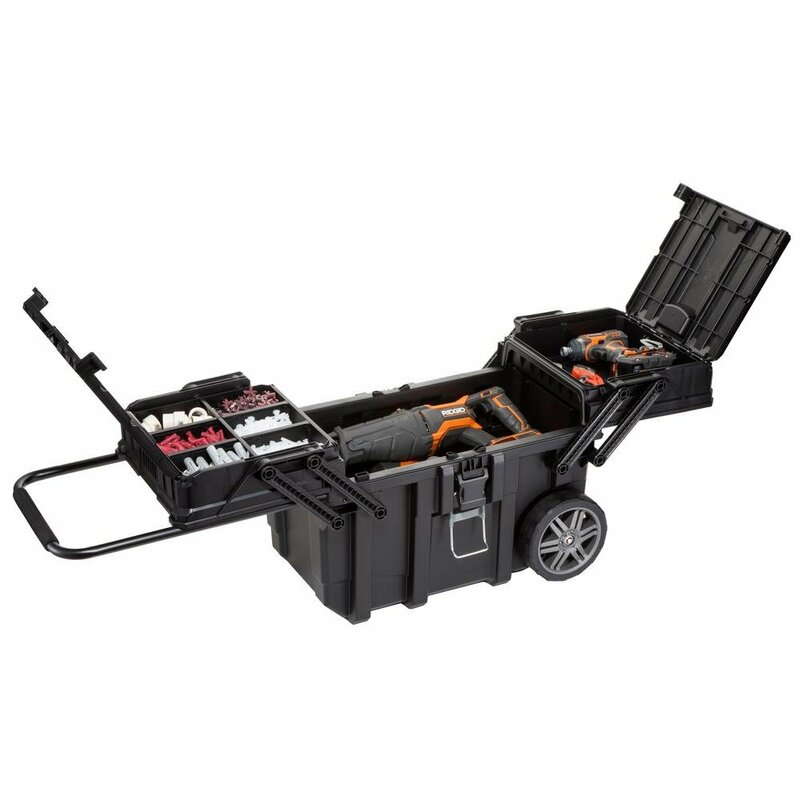 This heavy duty option is perfect for someone that needs a lot of compartments and mobility from their toolbox. The storage unit is light and the wheels offer easy movement. This storage unit is a great choice for onsite contractors. 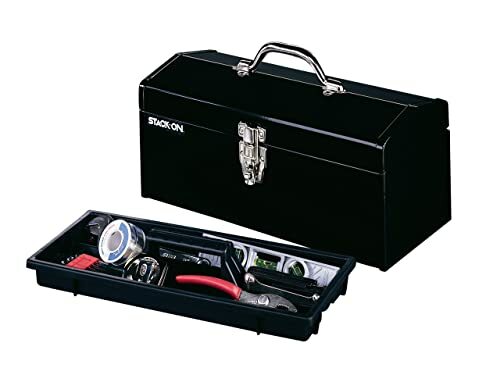 This tool box offers a deep drawer and a long handle that balances out the weight of the tools, excellent for carrying essential tools and on the travel. The TSTAK series has been a favorite for many consumers due to the added advantage of compatibility with other models from this series. This allows for smaller units to be stacked and used as larger storage spaces for all your tools. 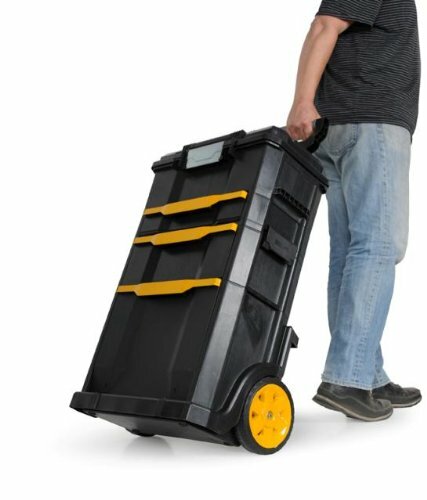 This toolbox offers a deep drawer and a long handle that balances out the weight of the tools, excellent for carrying essential tools and on the travel. DEWALT TSTAK III toolbox offers a deep drawer and a long handle. The platform of this toolbox is flexible and can be customized for different combinations. Thanks to the fixed dividers it is easy to keep small drills and bits organized and separated. The metallic latches are resilient and rust resistant. The long handle makes for comfortable lifting and a proportionate division of the weight. The lines of the walls of the toolbox are not straight, in part due to the TSTAK series function of stacking. The company sells the toolbox as structural design; the manufacturing on that aspect is poor. For example, the shelf drags on the bottom drawer because it is bowed. 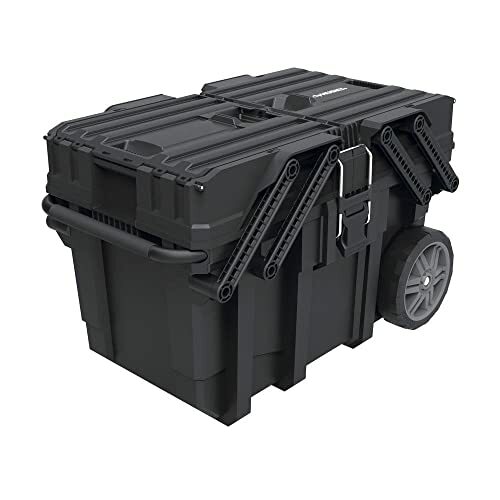 This is a basic model and is a good choice if you are looking for a storage unit for your chunky tools that have rolling around in the trunk. If you want to get the most out of every dollar you spend, the Bostitch is a perfect match. The toolbox has a mammoth capacity and has different compartments to every conceivable tool storage need. This model is all about the design and storage capacity. However, despite the increased storing capacity, the construct is not very sturdy under heavy usage. 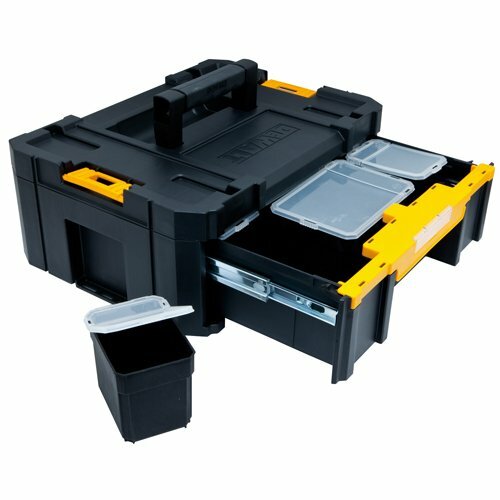 However, as in organizer, this is an excellent choice and for storage of light to medium weight tools. Another redeeming feature of the box is that it can be separated into two parts. The bottom bin can be detached from the toolbox with a drawer to offer easy transportation and more functionality. BOSTITCH Rolling Tool Box is lightweight and designed for optimum functionality. The seven-inch rubber wheels make transportation easy. The ball bearing slides are well built and quality items. If you are a contractor or any kind of technician that offers mobile services, this unit can be a godsend for you. For example, as a grooming tools carrier the box is ideal! The box is excellent for light to medium loads like arts and crafts materials, hair and makeup accessories, lighter tools etc. This is a stylish toolbox with structural design. The box is excellent for light to medium loads like arts and crafts materials, hair and makeup accessories, lighter tools etc. The drawers keep even the tiniest of things organized. The construct is steel and plastic; the frame is both sturdy and functional. This toolbox is spacious and can contain a wide array of small tools to accessories without a hitch. 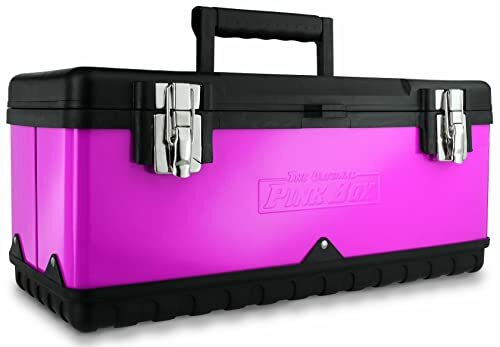 This toolbox is perfect for basic and regular usage by women. The company that makes this toolbox, targets women with functional designs and its iconic hot pink color. The design and both the drawers work wonders for scattered smaller tools. This toolbox is travel-friendly and keeps things tidy. 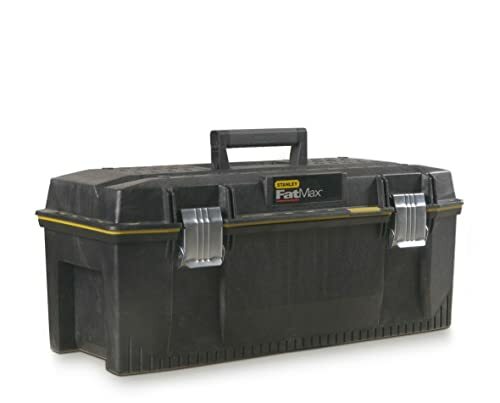 This toolbox offers great value for money. The design and both the drawers work wonders for scattered smaller tools. This toolbox is travel-friendly and keeps things tidy. 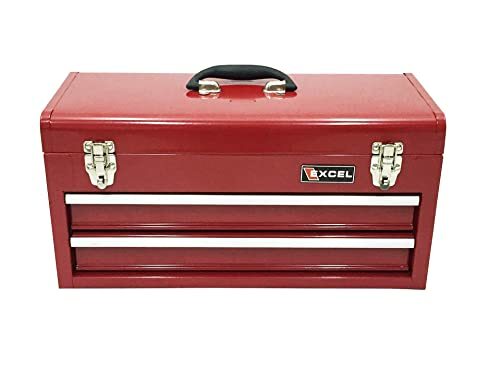 8)Excel Portable Steel Tool Box offers great value for money. This particular toolbox comes with full-length aluminum drawer pulls that make the sliding the drawers easy. The toolbox is made from cold rolled steel; this lends the box strength and it does not bend under heavier load like many plastic models. The handle’s easy grip makes carrying the toolbox easy. The tray inside is also made out of steel and very strong. This nifty little organizer has a transparent covering and inserts designed to keep all your tools visible and in perfect order. Ok, this option is not exactly a toolbox but rather a very customized and specified organizer. This works great if you have an assortment of Kreg tools or any matching tools. The custom inserts work great with Kreg tools and make the organizer travel-friendly. The transparent lid allows for easy access and no need to “dig in” and search for the required tool. A great way to keep accessories and tiny parts in an organized manner. 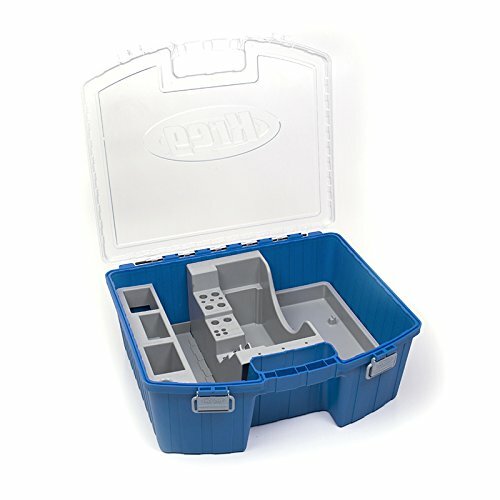 Customized sizing and compartments for Kreg tools only. 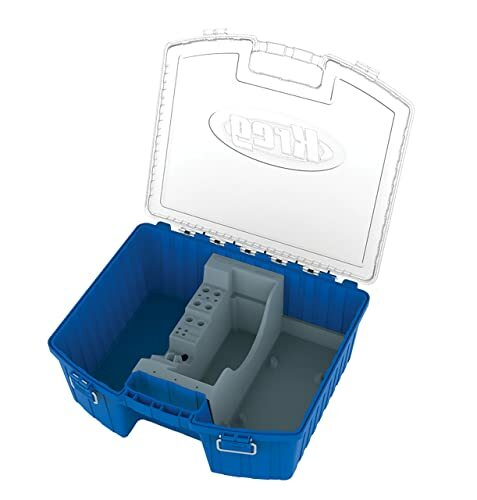 Any tradesman on the go, with a set of Kreg tools, can really benefit from this organizer. It keeps things aligned and in perfect order to use at a moment’s notice. The Deep Box is another spacious option from the TSTAK series. As discussed before, the best feature of this toolbox is the ability to stack with other members of this series. The load capacity of this model is good 44 pounds. 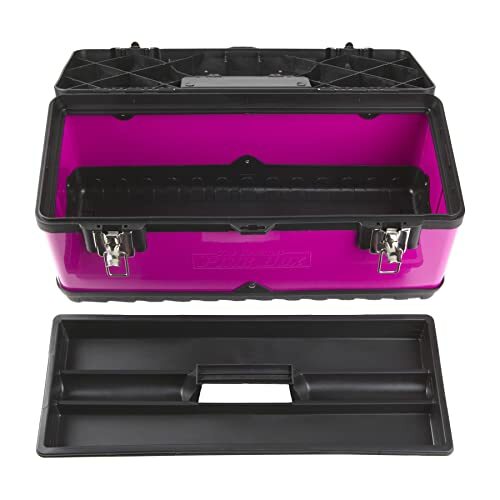 The deep toolbox is excellent for storing chunkier tools and carrying them around. Furthermore, there is enough space to allow all your essential tools lining up efficiently. The toolbox is an important purchase for all your tool needs. Depending on your trade, a toolbox could make your life very easy or very difficult. Nobody wants to lug around a heavy toolbox if all you need to store are a few essentials. Similarly, if you provide mobile repair services, you can’t have a ton of tool boxes that just slow you down on the job. Here are some things to remember when making a purchase to make sure you get yourself the best toolbox. This means different things for different people, some people correlate it with longevity. While others are on the lookout for something that is tough, can withstand damage, shock, and impact. Based on what you are looking for, steel tool boxes are better at taking rough usage than plastic options. 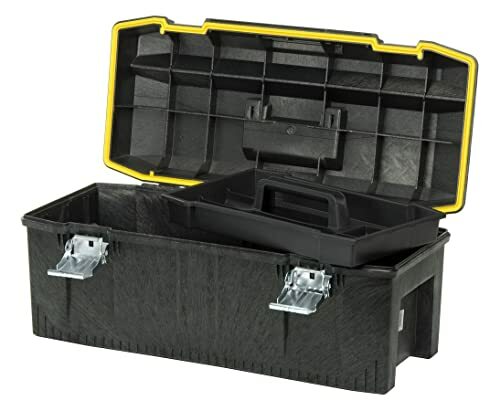 However, if you are looking for longevity structural foam toolboxes are a good choice as well. The size of a toolbox also depends on the user’s trade. If you are only a hobbyist and need a basic toolbox than spending too much money is silly. However, if you need to jug a substantial amount of tools on a job site all the time, size could make or break deal for you. A good sized rolling toolbox might be the answer to your storage woes. If you are not looking for a sturdy toolbox and you just need a travel-friendly option. Don’t opt for a toolbox that is too big or too heavy if all you need is portability. There are a lot of travel-friendly toolboxes that are both affordable and good for storing all your essential tools. If you just need something for your car’s trunk, a portable light toolbox is an answer. If you deal with electrical tools, a water-resistant toolbox is a must-have. A dust and water resistant toolbox is an excellent choice if you do electrical work. Some users have expensive tools and always look for a locking feature. get a heavier toolbox and a sturdier lock mechanism in your toolbox if you want it for safety purposes. Many plastic models have locks but people can break them easily so they offer zero protection. At the end of the day, it all comes down to “YOUR NEEDS”. Don’t go for the pricey model if you can find something cheaper to suit your needs. Don’t go for a cheaper model if you need protection and sturdiness. All in all, a good or bad decision really depends on what you need your toolbox for.